"A churning first theme collapses upon itself in a swirl of soft harmonies leading to a graceful allegretto, an interlude developed later in the third movement. A slow, spiritual-like second movement relaxes the mood even further. This hazy music returns in the finale, fending off a late recapitulation of the opening frantic theme." "[L]ovely ... a fine and graceful piece"
"[A] harmonically inventive, thoroughly engaging work... Beginning in rousing perpetual motion, a melody soars above the texture, leading after twisting cadences to a warm, contrasting section. The second movement...is sinewy and gorgeous." Sinfonietta for string orchestra is in four movements. These four movements are then paired in a non-linear fashion. The opening Allegro furioso is interrupted by a brief Allegretto, which acts more as an interlude to the fast music than as a complete contrasting section. This more graceful music is, in fact, a foreshadowing of the third movement, and will be more fully developed when it returns at that time. The second movement, Grave, is in the character of a hymn or a spiritual – the music from this movement will return towards the end of the last movement, both as a reminiscence, and as a part of a summary and closing of the entire work. As well, brief gestures from the opening movement attempt to break in to the final closing bars, but the energy from these gestures is not enough to rouse the music at the end, which soon disappears in a tonal haze of floating harmonies. Sinfonietta was composed in Yorba Linda, California, from the Fall of 1999 to the Spring of 2000. It was premiered by the Metamorphosen Chamber Orchestra under Scott Yoo on 28 September 2001, in Troy, New York. Sinfonietta has been recorded by the Slovak Radio Symphony Orchestra, Kirk Trevor, conductor and released on a 2003 CD devoted to Beck’s orchestra music, Wave (innova 612). 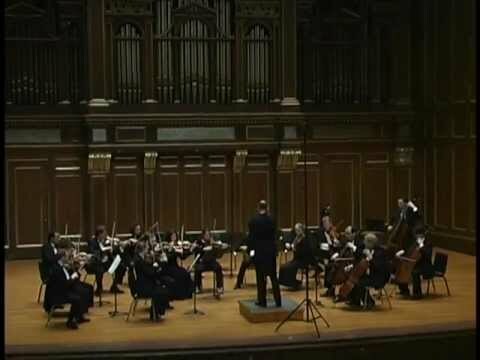 The video below of the Allegro furioso features the Chamber Orchestra of Boston, David Feltner, conductor, at the New England Conservatory’s Jordan Hall on 2 March 2007.